At the Columbian Exposition, the results of the spray method of painting, compared with the use of the hand-brush, were: A corps of hand-brush painters, working in the usual manner of applying kalsomine, averaged about 800 square feet of surface daily, while 16,000 to 20,000 square feet were covered by a spray-machine in eight hours, 30,000 square feet having been reached under favorable conditions. In the Manufacturers' Building, with a daily average of thirty men using spray-machines, at the end of eighteen working days, 1,332,700 square feet of surface had been covered; equal to an average of 2368 square feet per day per man. This was during the coldest days of winter, when the water paint, in attempting to spread it by hand, froze solid. 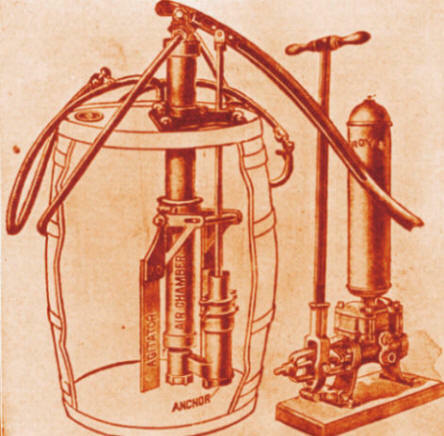 The spray required about twenty-one gallons of kalsomine against twenty gallons by the brush, but the saving in labor was nearly twenty to one in favor of the spray process. Gas-holders in duty are exceptionally hard to paint. One painted by spray, using iron-oxide paint, averaged from 2700 to 2900 square feet of surface per hour for three men using two sprays. The amount of paint used was not notably more than with the brush. The cost of the labor was less than 1/2 cent per square yard. In the Michigan Engineers' Manual for 1897, Mr. J. J. Huber describes an extemporized spray-machine, and the results in painting 100,000 square feet of rough hemlock siding with iron-oxide and raw-oil paint. The mill company built a spray-machine for twenty dollars, and the result of its use was, that one gallon of paint covered 150 square feet of rough-board surface. Two men covered 5000 square feet per day. Cost of the paint applied, ten cents per 100 square feet. Cost of the paint, labor, and apparatus, fifteen cents per 100 square feet, or less than one-half that of painting by hand. The paint could be applied from eight to ten feet above the spraymens' heads, and ordinary laborers could do the work. Fig. 41.- Field spray apparatus at work. In some experiments made by the P. & L. E. R. R., using a spray apparatus for painting box freight-cars, the time required was thirty minutes per car; one man with an eight-inch brush following the spray thirty minutes more, or total of one hour per car for each coat. To paint a 60,000-pound-capacity coal-car required two men twenty minutes each, spraying the lettering not included. At the Master Car and Locomotive Painters' Association, in 1897, Mr. H. G. MacMasters, M.C.P.I.C.RR., reported the comparative time and costs in detail of painting box freight-cars by brush and spray. Result 1.98 to one in time, and 2.82 in cost, in favor of the spray. The danger to the health of the painters in the use of the spray is very marked over that in the use of the brush, whether kalsomine, iron oxides, or mixed paints are used. In the spraying of lead paints or those containing any metallic oxides the dangerous effects are greatly increased, even when the greatest possible care is used to guard against them. The fine mist-like spray is readily taken into the lungs at every respiration, and is more thoroughly introduced into the system than is possible by absorption from contact in painting by hand. Fig. 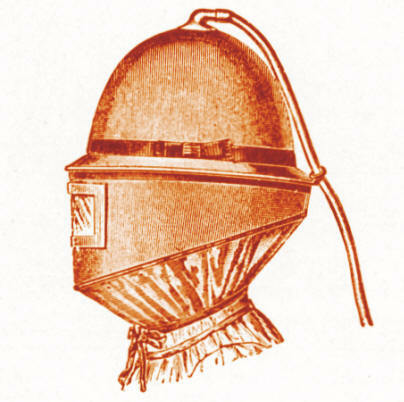 42.- Mathewson's patent helmet for painting by spray or cleaning by the sand-blast. The extra amount of paint, about 5 per cent, used by the spray is offset many times by the saving in labor, as above noted. These were applications from compressed-air installations used for other purposes than painting. The merit of oil-paint spray coatings has not been fully established. The spray necessarily carries a part of the air with the condensed moisture in it into the paint, and its subsequent escape by expansion and evaporation must result in a more porous coating than with paint applied by a hand-brush. Following the spray immediately with a brush will remove the porosity to some extent. The brushing out of any paint is a great factor in its durability, and as the use of the spray renders the employment of a cheaper grade of labor more feasible than with the use of the brush, the effects of an indifferent use of painter's "elbow-grease "_ will soon reveal itself in the decay of the coating. Fig. 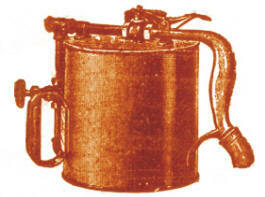 43.- Barrel and hand-power spray apparatus. Upon metallic surfaces the sprayed paint proves more perishable than when applied to wood. For use in the field for repainting iron bridges, walls, and other structures there may be a saving in time of the painters, scaffolding, etc., but the work cannot be as well done as by the use of the brush. 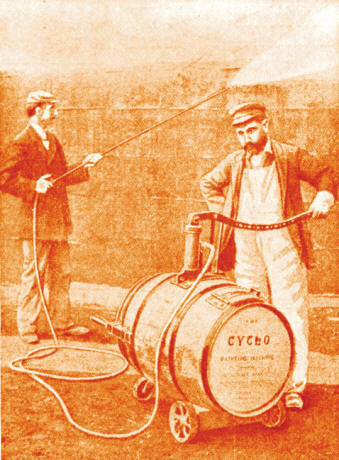 The cheaper and less responsible laborer generally employed to use the spray apparatus will neglect the necessary scraping and steel-wire brushing requisite in all repainting work, as well as the subsequent brushing out of the spray coating, particularly in the places difficult of access, where a thorough application of the paint is most necessary. Peeling of the paint and corrosion promptly follow any extended application of an oil-paint spray coating on a ferric body in situ. The methods of painting were recently discussed by the Western Association of Railway Superintendents of Bridges and Buildings, in answer to a circular asking for information upon the subject. Eighteen answers were received. All were in favor of the sandblast for cleaning either new or old metallic surfaces preparatory to painting. Six were in favor of the air-spray for some classes of work, three were opposed to it, and nine were non-committal. Two who had tried it were opposed to it. One superintendent said: "On iron bridges other than on plate girders I found that there was more paint wasted than applied to the structure. The waste in attempting to paint lattice-truss work was very marked, and the coating was not equally or well spread." He favored the use of a stiff hard brush to insure a close contact of the paint, which he could not get with the spray. Too much air was incorporated with the paint by the spray, and would not release itself in the drying of the paint. It left the coating more porous than with the use of handbrushes. Following the spray with a hand-brush did not materially help the coating in durability, when compared with surfaces spread on the same structure at the same time, by the same painters using hand-brushes, and the same paint. "The use of the spray, following it with a heavy hand-brush, was admissible upon some of the large wooden buildings, as the failure of the paint in these cases was not attended by corrosion, blistering being the .principal cause of failure in the sprayed coating on wooden and masonry surfaces." Fig. 44.- Hand spray apparatus. Generally, heavy or very thick oil paints cannot be successfully spread by spray, unless under air pressures of sixty or more pounds per square inch. This renders the use of the spray for oil paint useless, unless power other than handpower is available, or the paint is applied quite hot to increase its fluidity. If the paint is thinned with benzine or turpentine to the point where a moderate pressure of air will enable the spray to work without choking in the nozzle, all of the objections to this class of paints are increased, as the extra amount of volatiles in them to be evaporated leaves the coating more porous and hastens its decay. Two coats of such air-sprayed paints are required to equal in protecting power one coat of heavy hand-brush work. With kalsomining or water paints the spray apparatus finds an almost uncontested field, and from the great saving in labor is recommended.